Before we left the glorious Albergue Verde, we asked the hospitaleros about the next stop. When you walk off-season like we do, this can be the best information you get all day: where do we stop next? The answer was simple. 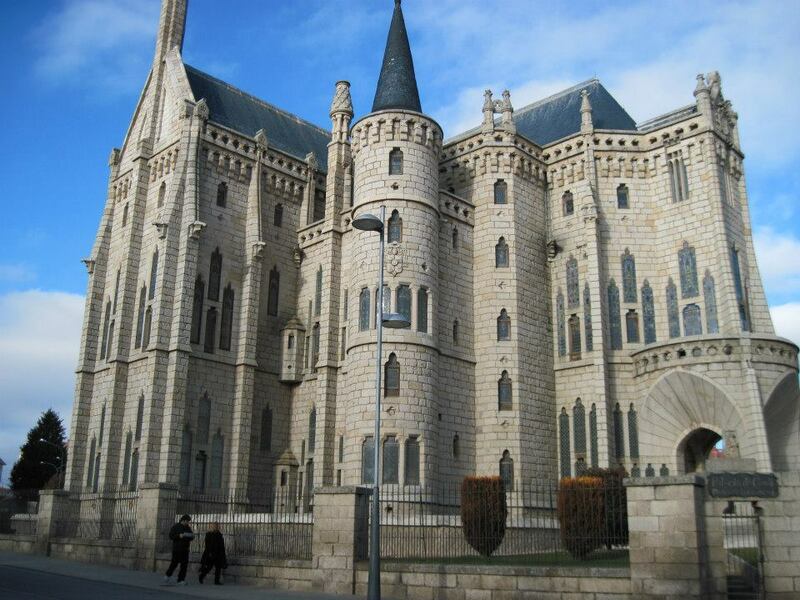 They recommended we pass up staying in the larger town of Astorga and stop in Murias de Rechivaldo. Walking into Astorga, we stopped by the wonderful Roman mosaic floor exhibit along the road and I took some photos of Gaudi’s Bishop’s Palace. The actual cathedral is lovely but it’s the Gaudi building that you’ll remember. The arrow slit stained glass windows and the play of light and stone is wonderful. I remember thinking to myself that if I were a Gaudi fanatic I might have made the trip to Astorga to see it, but beyond real fanaticism, walking the Camino is the only other way to experience it. Sadly, all the chocolate shops were closed. Astorga is known for chocolate. We had some the night before and thought it might be fun to try something, but nothing was open when we got into town. We walked past and came into a tiny town where nearly everything was covered in some kind of stone. No dirt, no grass, and only a couple of trees surrounded by stone buildings. It was really lovely. And again, nothing was open. Well. to be fair, the bar at the other end of the street might have been open, but there really is a limit to the number of bars you can visit in any given week and I was getting close to that limit. So, we spotted a phone number on an albergue – something to the effect of, if you need a place to spend the night, just call us. My daughter rang them up and, with apologies that they needed to stop to pick up breakfast for us, they said they would be there in just a few minutes. A woman and her brother pulled up and unlocked the front door. Since there were only three of us, she said she wouldn’t be opening the albergue to us but she’d let us into the house. We walked in, set down our poles and backpacks and she explained how the house worked while her brother lit a fire in the living room. Upstairs were bedrooms and across a patio, there was a kitchen with a communal-type dining room and computer set-up. In the summer, the place is probably filled to capacity, but in December, we needed flashlights to get across the patio and did not see another soul in Murias after they left. I lay down for a while, my older daughter warmed up by the fire, and my younger daughter made us dinner from food she found in the pantry. We had spaghetti with some canned vegetables and bread and I used the WiFi to check into my E-mail account. In the morning, we made coffee and had bread and butter before locking up and heading out. 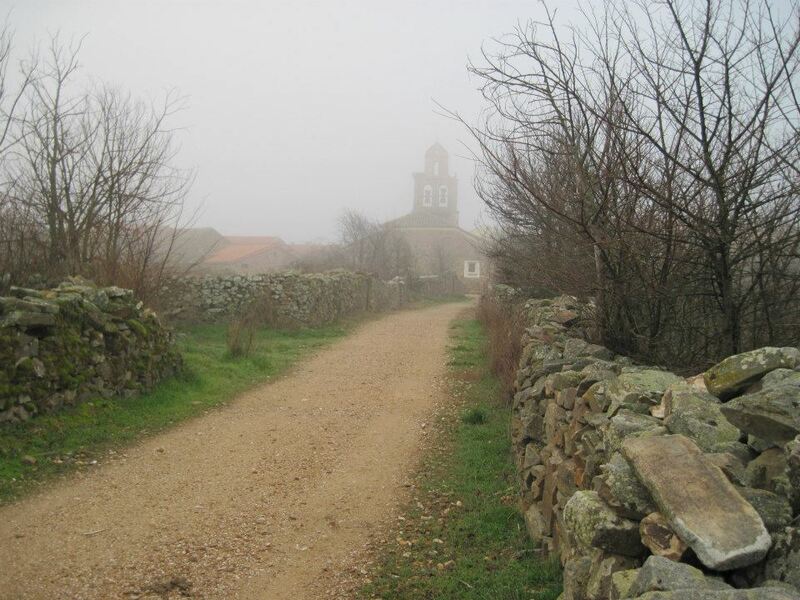 The fog was so thick we could barely see the road ahead of us as we walked toward Santa Catalina. One of the pilgrims we met in Hospital de Orbigo had told us she wanted to walk farther and had planned to stay there, but we didn’t see anything open there either. That’s always one of my worries – that we’d walk farther, find there really was no place to stay, and have to walk farther still. I was struck by the kindness of the sister and the brother who trusted us enough to give us that house. It is common to experience small kindnesses along the Camino, but this was anything but small. Being able to warm up next to the fire and know that breakfast would be waiting for us when we got up in the morning – truly extraordinary for three tired pilgrims. Posted in Camino Frances. Tagged backpacking, Camino, caminodesantiago, Spain, travel.